University of Waterloo physicists have succeeded in measuring how the surfaces of glassy materials flow like a liquid, even when they should be solid. A series of simple and elegant experiments were the solution to a problem that has been plaguing condensed matter physicists for the past 20 years. 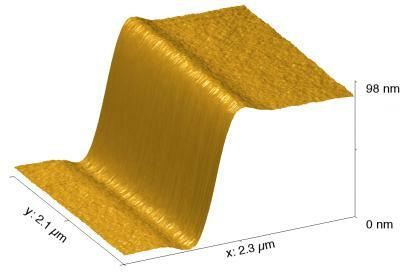 Understanding the mobility of glassy surfaces has implications for the design and manufacture of thin-film coatings and also sets practical limits on how small we can make nanoscale devices and circuitry. The work is the culmination of a project carried out by a research team led by Professor James Forrest and doctoral student YuChai from the University of Waterloo as well as researchers from ÉcoleSuperieure de Physique et de ChimieIndustrielles in France and McMaster University. Their groundbreaking work was published in the scientific journal, Science, this week. "Glasses are fascinating materials. At low temperatures they're solid, and at higher temperatures they're liquid. At intermediate temperatures, it's hard to consider them as only one or the other," said Professor Forrest. "Surfaces of glassy polymers shouldn't flow below the glass transition temperature, but they do. The question is why." Glass is much more than the material in bottles and windows. In fact, any solid without an ordered, crystalline structure is considered a glassy material, so metals, small molecules, and polymers can all be made into glassy materials. Polymers, the building block of all plastics, are almost always glassy rather than crystalline. These materials undergo a transition between a brittle solid and a molten liquid in a narrow temperature range, which encompasses the so-called glass transition temperature. In a series of experiments, Forrest and colleagues started with very thin slices of polystyrene stacked to create tiny staircase-like steps about 100-nanometres high -- less than 0.001 per cent the thickness of a human hair. They then measured these steps as they became shorter, wider and less defined over time. The simple 2-dimensional profile of this surface step allowed the physicists to numerically model the changes to the surface's geometry above and below the glass transition temperature. Results show that above the transition temperature, polystyrene flows entirely like a liquid; but below this temperature the polymer becomes a solid with a thin liquid-like layer at the surface. Being able to calculate how these nanostructures may evolve over time and under what conditions will bring engineers a step further towards making nanotechnology an everyday reality. Professor Forrest and doctoral student Yu Chai are from the Department of Physics and Astronomy in the Faculty of Science. Forrest is also a University Research Chair, a member of the Waterloo Institute for Nanotechnology and an associate faculty member at the Perimeter Institute. The project team also includes Kari Dalnoki-Veress and J.D. McGraw from McMaster University and Thomas Salez, Michael Benzaquen and Elie Raphael of the École Superieure de Physique et de Chimie Industrielles in Paris.